German mechanical engineering firm Voith is set to supply six gear units each for 134 of the Series EP20 electric locomotives, as part of Russian Railways’ (RZD) fleet modernisation plan. With a maximum output of 7.2MW, the Series EP20 mainline locomotive has three bogies with two driven axles each. These locomotives are being built by Russian manufacturer Transmashholding (TMH) since 2011. Voith, which will begin supply of 12 gear units to RZD every month starting 2014, claims that its new SEH-525 gear unit is suitable for temperatures from -50°C to +55°C which would make heavy demands on the drive units of the locomotive. "Voith claims that its new SEH-525 gear unit is suitable for temperatures from -50°C to +55°C which would make heavy demands on the drive units of the locomotive." SEH-525 gear unit is a fully suspended single-stage helical gear unit with a hollow output shaft. RZD will put a total of 200 new EP20 locomotives into service with the first ones already in operation on Moscow-St. Petersburg route with maximum speeds of up to 200km/h. Visitors to the 2014 Olympic Winter Games will also benefit from this modern rail power package when they are on their way to Sochi, Voith said. With presence in energy, oil and gas, paper, raw materials, transportation and automotive areas, Voith generates €5.7bn in sales, operates in about 50 countries worldwide. In February, TMH signed an agreement to provide maintenance for Russian Railways’ EP20 dual-voltage electric passenger locomotives. Under the deal, TMH will be responsible for routine and non-routine maintenance throughout the locomotives’ lifecycle. 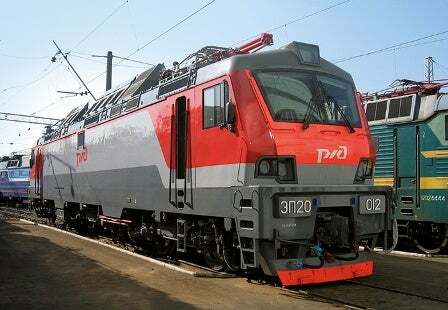 Image: EP20 is a type of six-axle electric passenger locomotive. Photo: courtesy of Voith.